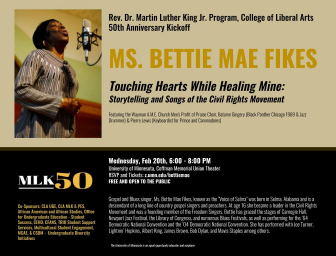 Gospel and Blues singer, Ms. Bettie Mae Fikes, known as the “Voice of Selma” was born in Selma, Ala. and is a descendant of a long line of country gospel singers and preachers. Ms. Fikes began singing alongside her mother at age four and at age 16, she became a student leader for the Student Non-Violent Coordinating Committee in the Civil Rights Movement and was a founding member of the Freedom Singers that traveled with Rev. Dr. Martin Luther King Jr. during the Freedom Rights Struggle. Bettie was just a teenager when she started, she was jailed for several weeks for protesting during the voting rights struggle but continued using her powerful voice to stand against injustice. Her program will highlight her journey, invite the audience into the songs of the civil rights movement, and provide a loving reminder that, at any age we have the power to create change, to inspire others to join us, and to use our talents to truly impact the course of history. Due to weather we are cancelling tonight’s concert with Ms. Bettie Mae Fikes. We will be re-scheduling in the next 2-4 weeks and will e-mail you when a new date and time has been set. Please e-mail mlkdesk@umn.edu if you have any questions.